Fresh of press is a new article in the journal Animal Conservation (FULL TEXT HERE). In it we describe an intervention to reduce demand for bushmeat in northern Tanzania. 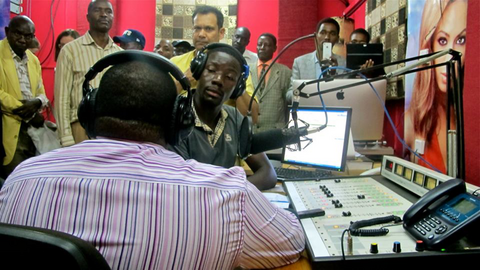 The intervention was centered around the 1-h radio show My Wildlife – My Community which included 15-min episodes of the radio drama Temboni, designed by PCI Media Impact. Each episode of the radio drama was accompanied by a 45-min interactive call-in show featuring interviews with experts and local information about available community resources. We evaluated this intervention using a Before-After-Control-Impact framework based on longitudinal data from 168 respondents. To account for the fact that respondents volunteered to be exposed to the intervention, in this case the radio show, we used a matching algorithm together with regression to ensure that we could build a credible counterfactual group. Our analysis did not uncover any differences in outcomes between the treatment and control groups, and thus no evidence of the intervention achieving its initial goals. One potential causal mechanism that could have led to this outcome is the low audience penetration rate. Fewer than 40% of respondents listened to the show and among those who did, only about 20% listened to five of more episodes. This research highlights the challenges of implementing and evaluating interventions delivered through mass media in developing countries, and the importance of reporting on interventions even when there is no evidence that they achieved their initial goals. Only through robust evaluation of behavior change interventions and the sharing of lessons learned can conservationists successfully tackle complex issues such as the bushmeat trade.